ChangeWell Blog: You’re a Brand – What’s Your Plan? You’re a Brand – What’s Your Plan? If you have a name – you’re a brand. A “brand” is a business identity or name of something (product or service) or someone specific (like you). A “brand” causes the generic to stand out and be differentiated. A simple example is how a commodity like sugar was turned into a very well known and successful brand. This happened in 1900 when a Brooklyn New York sugar processing company emerged as Domino, one of the original companies in the Dow Jones Industrial Average. The ad from 1910 above is for Domino sugar cubes, which the ad claims, are “handier and prettier,” as well as offering “more perfect purity…and less waste.” Clearly, Domino sugar is different from any old pile of sugar. Providing sugar in cubes immediately re-positions all other sugar as ‘old fashioned.” Different is good. Because if it’s “different,” it’s easier to claim that “it’s better.” If it’s different, better, more costly all those elements may make it more desirable to some people. Be different in a way that appeals to your customer and stands out versus competitors. Get your brand noticed, known, and remembered by your target customer. So where do you start? Or, if you’ve started, how can you make progress? You may not be a household word. Most likely there are other people in the world who have a name that is similar or even identical to yours. Some of them may even do what you do. They may even live in your area and compete with you. So, given that, how do you stand out as unique in the entire world? Well, here’s some good news – if you deliver a professional service, most of your business will probably come from the people who live right around you – maybe no more than 25 miles away. So you don't need to dominate the world. But you should build your brand as if that’s your intent. How do you construct a global brand identity? Let’s starts with some basics. 1. State Your Mission – In two or three sentences clearly state what you do, who you do it for – and why. And make the “why” something inspiring that expresses a possibility for all people everywhere, even those well beyond your service area. This requires some thinking and reflection. Making money is not why you are in business. That’s an outcome. Somewhere in your story there is a moment where your life changed and you saw a possibility for your unique contribution. That’s “why” you’re doing what you do. Because you thought that producing that result for as many people as possible would be a satisfying way to live your life. Simon Sinek, author of Start with Why says: “People don't buy what you do, they buy why you do it.” In 1980 Steve Jobs said Apple’s mission was to contribute to humanity by making tools for the mind that help people change the world. That’s a “why.” Notice there’s nothing in there about “cutting edge technology, enhancing share holder value, dominating markets,” etc. While all of that is important, not much of it is inspiring. Find a why that makes you want to get up early and go to work so you can experience the thrill of contributing. 2. Name Your Brand – If you are doctor and you have a good reputation in your community, you are already a “brand.” People already choose you over other practitioners who do what you do. Your business is like a long running Broadway show in which you’re the star – for now. But when you leave, the show will go on, but another star will take your place. Your job: identify that star and prepare for the eventual transition by building your corporate brand so it stands on its own. 3. Align Products & Services – List them all and their features & benefits. Do these relate to your why? What products or services could you add to fill out your brand identity and maximize revenues and profits? 4. Listen to Customers & Prospects – In your brand communication, you should reflect the “voice of the customer.” What do they think about you? What do they think about your competitors? Here’s an easy way to hear that voice. Read your Yelp reviews and those of your major competitors. You’ll quickly learn how customers and prospects think about what you do. Caution: it may seem that people don't appreciate all your degrees, your state of the art equipment, and your beautiful offices. Instead it may seem like they focus on the trivial. Like: did the appointment start on time? Is your staff friendly and helpful? From the patient perspective – that’s not trivial. It’s very important. Patients may not be to able tell how good a doctor you are. They may not be able to figure out whether your prestige degree makes you better, or if your new expensive machine provides better outcomes. They expect you to meet, and hopefully exceed, the “standard of care,” even if they don’t know that there is such a thing. It’s a given and they may not be able to detect it. But they’ll notice a grump in the front office. And if that shows up on Yelp, it may keep new patients away. You can also do customer surveys with a tool like Survey Monkey. Use two kinds of questions. Brand features vs. brand performance. Any feature that ranks “7” or higher is “Important” or “Very important.” On those features, your performance should be high. A finding that “being on time is very important to 90% of our prospects. But only 42% of our patients rated us “7” or higher should be a sign that improvement is urgently needed. 5. Focus on Improving Performance – High performance on important brand features is essential. To start the improvement make a list of what your customers value. Prioritize it and communicate it to your staff. Reinforce these values in all your communications. 7. Adopt a “Brand Style” – Human beings learn through repetition over time. One of the keys to successful brand building is consistency. Create a style sheet that you will use to guide your brand. How does it look? When your brand speaks in customer e-mails, brochures or in social media – what does it sound like? Is it friendly or formal? Serious or light hearted. Use your “brand style sheet” to check every communication before it goes out. 8. Develop Brand Standards – When you see an ad from Target on TV you know instantly that it’s probably them. The ads look like the stores. The stores look like the ads. That’s because their ads all conform to a pre-determined style that reinforces the brand image. Your brand will come to life more vividly for your customers if you have a “brand method” of delivering service and you deliver every service according to that method. 9. Be True to Your Brand – in everything you do. If your brand says you’re the friendly family dermatologist, everyone who works in your office should project that every day in everything they do. It’s not enough to tell customers. You have to actually be it and do it. 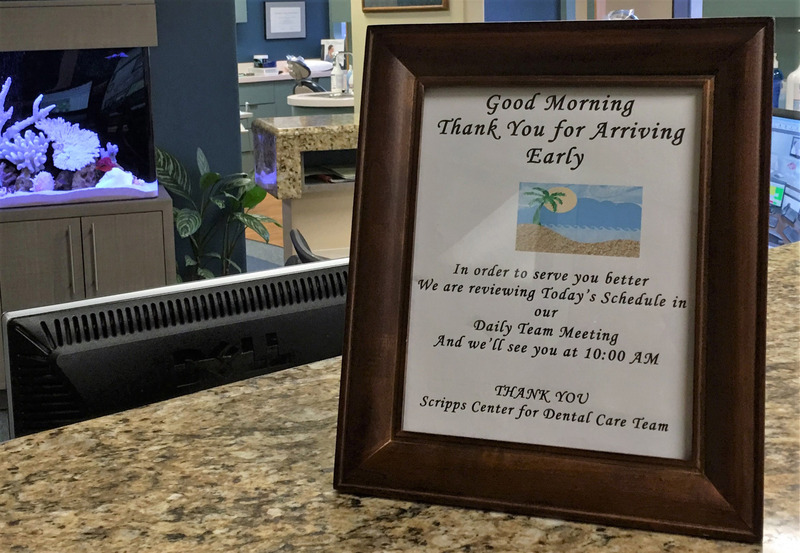 Here’s an example from Scripps Center for Dental Care, a San Diego practice that consistently delivers high levels of friendly service. Thank you for arriving early. We’re organized in a team. Our team cares about you. We’re in a meeting actively reviewing today’s schedule so we can serve you better. We’ll be on time at 10AM, as we promised because we know your time is important. The sign is friendly, informal, and does not appear that a whole lot of time was spent on it, but it’s effective in reinforcing the look and feel of the brand as well as some of its most important brand values. 10. Own the Business – Run the Marketing – It’s very tempting to think: “I don’t know anything about this website stuff, I’m too busy, I’m going to hire a millennial and let them do it.” We know from our survey of A4M members that many practitioners are unhappy with both their websites and their social media strategy. If you share those opinions, it’s vital that you get involved in the marketing of your business. We’re not saying you have to “do the marketing.” We are saying you should know and direct what is being done and why. Ultimately, good marketing is mostly common sense. While anything that deals with the human mind and perceptions can get tricky, you are usually on solid ground when you ask common sense questions. Why are we doing this? What specific market opportunity does this activity or expenditure address? What’s the evidence that supports this? What do we intend to happen here? What’s the outcome we’re looking for? How will we know if it happens? What metrics are we using to measure results? This line of questioning ends in the statement of a specific, measureable achievement to be accomplished by a deadline. What results have we achieved so far? What was our expectation? How do the results so far compare to what we thought would happen? What’s the trend line? At the upcoming A4M Practice Enhancement Training April 5 & 6 in Hollywood Florida, we will be exploring these topics in depth. We’ll provide you with a high level overview of marketing theory and best practices so you can apply them successfully to your practice. We encourage you to attend and bring your staff. In the meantime, if you have a marketing or branding question, write to me and I’ll answer it for you at no charge.